When Zucca opened not so long ago, a fanfare followed. Bloggers and reviewers alike were won over with its straightforward Italian cooking, showcasing great ingredients and simple & delicious flavour combinations. It had made a heralded entrance onto the restaurant circuit, and being located in the wasteland that is Bermondsey, this was no mean feat. People were willing to travel south, a sure-fire sign that something was up. Arriving for lunch, I was stunned with the simplicity of it all. An airy dining room with an open kitchen, white tables and white chairs. I liked it. We sat down and immediately were treated to an array of bread and some olive oil. 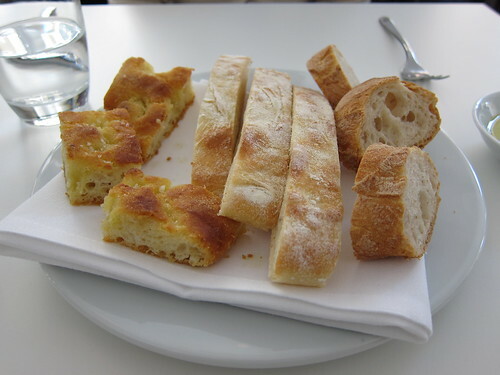 It's not often I make the effort to talk about the bread but the 3 slices of focaccia were superb, slightly oily and crunchy on the outside and bouncy on the inside. Matched with the grassy olive oil, I snaffled the last piece without even asking. I don't like being rude, but it was that good. With a mere 3 choices under each heading (fish, meat, starters, pasta, dessert), the menu is tight. We opted for starters and mains, not wanting to go too crazy. Soon enough, my pigeon crostini and speck arrived. Pretty decent, but very boring. 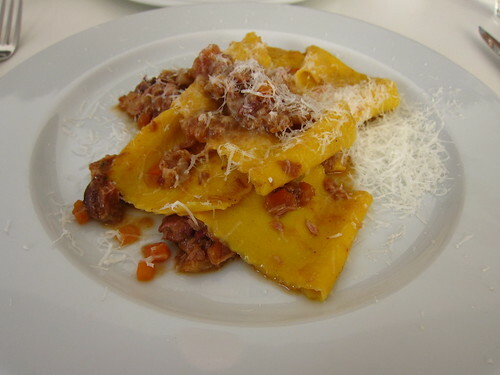 On the other side of the table was a starter portion of pappardelle with a ragu. The smells wafting across the table were drawing me in, sirens in the form of pasta. I think my dining partner saw my pitiful eyes and asked me if I wanted a bite. I almost bit her hand off. Soft yet perfectly al dente homemade pasta intermingled with delicious ragu, packed with flavour from all sorts of morsels of meat. God it was good, I looked down at my plate and almost cried. It appears that I am not blessed with making the best choices at the dinner table. Starters done, our mains were on the way. I was blinded by the words "pork" and "belly" and ordered it without thinking. This was going to be a winner, pork belly never fails to excite me. It was placed in front of me and it looked great, so far so good. First taste was decent, the beautifully rolled slice of pork belly mingling well with the salsa verde. It was sat on a bed of lentils which are nigh on the most pointless of vegetables (after most beans) and added nothing but annoyance. Nice, no crackling, but still rather enjoyable. When I had taken time to look up, I saw the most joyous slab of meat sat opposite me. 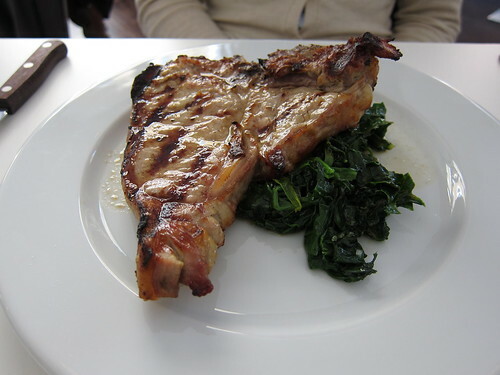 A huge veal chop perched on some steamed greens. It was simple yet it was so beautiful, I shed a small tear. Again, my dining companion took pity on me and offered me a bite. So soft and tender, each chew was heavenly. The light taste of the veal which had a slight char, and a small rivulet of fat on the outside, each chew was better than the next. I looked down at my pork, it had been ousted from my heart, I only had love for the veal chop. I made my puppy dog eyes, but this was a battle I was not going to win. No more veal chop for me. Too full for desserts, we opted for a quick stroll to nearby Borough market for some coffee. Zucca had been an enjoyable experience. The service was highly personable and friendly without being imposing, ushering in a very nice and comfortable vibe. The food, well, pretty decent and the verdict on the cost, very affordable with mains at around the £12 mark. On reflection, my dishes were still of a good standard but I was blown away by the food sat across from me on the other side of the table. And the bread, how can I forget THAT bread? 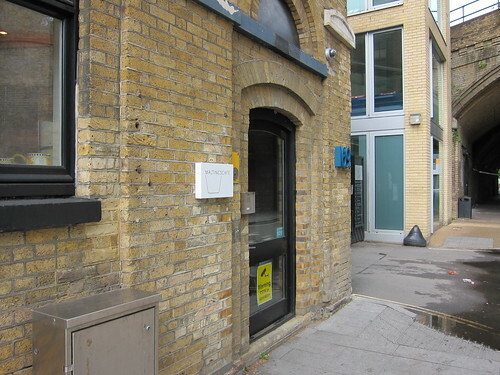 A few weeks later, I was lucky enough to accompany my friend down to Maltings Cafe, effectively where it all started and a mere stones throw from Zucca on Tower Bridge road. 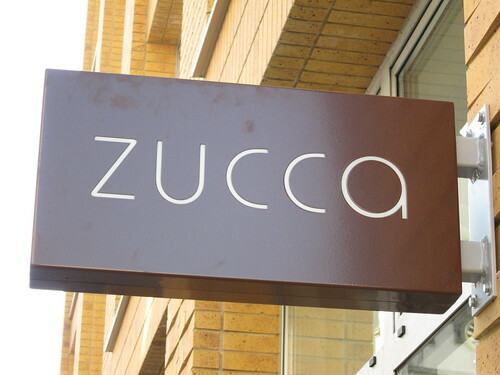 The smaller but older brother of Zucca, it focuses more on "Mediterranean" cuisine, although the influences still seemed to be firmly based in Italy. It was tiny inside and packed to the brim by 1pm. Disappointed punters were ushered towards the takeout counter, which appeared to be doing a brisk trade. I chewed on some familiarly moreish bread (no focaccia this time) and perused the menu written neatly on a chalkboard. This was even more streamlined than Zucca, with one side, one fish, one meat and one pasta option. They were spoiling us with desserts as there were two on the menu. We felt a little embarrassed but decided that ordering everything was the order of the day. The waitress smiled and said "Don't worry, it's quite common". I am glad to say that I was very pleased with my choice this time. The char grilled steak was absolutely heavenly. 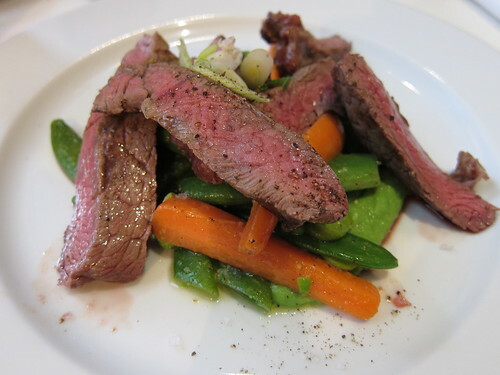 Sat on a salad of warm vegetables, I thought that the dish could have done with a tad more moisture to bind it all together, until I discovered the broad bean and pea (I think) puree that the whole dish was sat on. I had no aspirations in trying my companions pan fried squid with squid ink risotto and it was my turn to hand over some of the goods for her to try. The accompanying polenta had no aspirations in rocking my world, but then again, it never had a chance. I have no real love for the yellow gloop, creamed or baked. Our other "side" was an interesting pasta dish which we shared. I had never heard of "mafaline" before, but it turns out it’s a fat tagliatelle with a crimped edge. 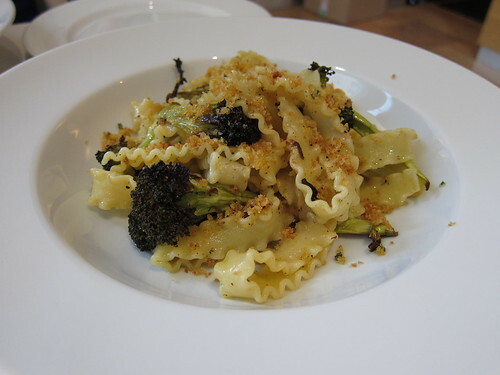 Cooked with roast broccoli, and topped with a spicy breadcrumb topping known as a pangratatto, I revelled in its simplicity. Really enjoyable and was an excellent accompaniment to my slices of steak. 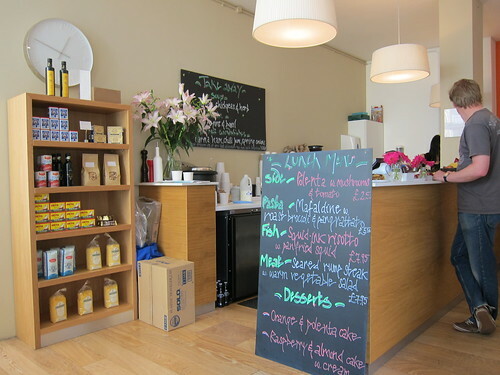 Maltings cafe is not designed to serve hearty portions, but each serving is just right. Even eating everything on the menu between two, the bill came to less than £30, excellent grub at affordable prices. It's amazing what you can achieve by just using a few key ingredients and cooking them well. I love the fancy restaurants where they do everything 15 ways with sploshes and swirls culminating in a piece of art that you feel guilty eating, but sometimes you just need to kick back, savour the simplicity and enjoy your food. I will be back, and next time, I am getting the veal. Maltings is on my hit list - let me know if you fancy a revisit one luchtime soon! 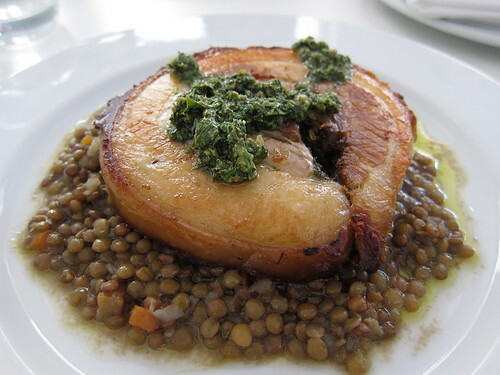 Both look very good, especially the lentils. @Lizzie - Happy to return any time. @GG - Seems like I missed out on the desserts. Note to self, make more room next time. @Josh - Lentils are pure evil. Fact.